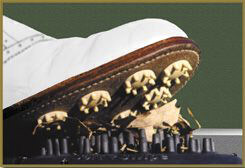 Improve your golfers' traction, safety, and performance! First and only cleaner designed specifically for non-metal cleats! 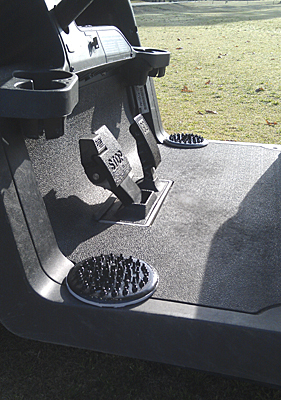 Enhances traction and safetyfor all golfers. Simply Swipe Your Spikes across the rubber tips and traction is restored. Perfect complement for the non-metal spike trend. Swipe Your Spikes and easily rinse with water. No spike cleaner is more accessible and effective. attaches to the floorboard with four self-drilling screws. Helps to reduce the spread of Poanna to tees and greens. to order SoftSwipes® for your fleet. Available through all golf car manufacturers!